Built in Britain, Best selling UK produced car, Best selling retail car for three consecutive years, how could Peugeot improve the 206? With over 530,490 sold since its introduction in 1998, the basic concept clearly meets the requirements of the UK motoring public. This month, however, will see the introduction of a number of exciting new models to join the successful dynasty. 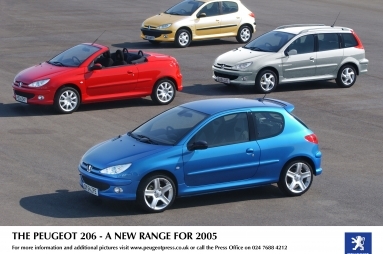 The new Peugeot 206 range will still start with the 206 Independence 1.1 three door model, with a mono CD player as standard and now available at a fantastic lead in price of only £7595 on the road. Moving up the range, the 206 Style is now deleted and replaced by the 206 S 1.1, with an on the road price of only £8420. Building on the success of the 206 Zest, the new 206 Zest 2 is introduced. Based on the current 206 Zest with its exciting "Pop’ art" trim, it is now available with either a 1.1 or 1.4 litre petrol engine or the economical and low CO2 emitting 1.4 HDi diesel engine. With air-conditioning now a standard feature and with prices starting at only £8395 on the road, this will become one of the coolest 206 models in 2005. With a great heritage in motor sport, culminating in three consecutive World Rally Championships, the new star of the 206 range brings all this motor sport experience into the UK showrooms in the form of the 206 Sport. Available in both three and five door versions, with two petrol engine options, a 1.1 or 1.4 16v and also Peugeot’s legendary 2.0 litre HDi diesel engine, this model provides the fully body coloured visual appeal of a GTi at a cost normally associated with non sporting models. Alloy wheels, digital air-conditioning with climate control, fog lights and a stereo radio / mono CD player are all fitted as standard equipment. Sporting a starting price of only £8995 on the road, this model won’t hang around for long in the showroom. Continuing on a sporting theme, the 206 Quiksilver now becomes available with either a 1.6 litre petrol engine or a 1.6 litre HDi diesel unit, both producing 110 bhp. 15" Sirocco alloy wheels, front sports wings, digital climate control with air-conditioning, all become standard fitment. The 1.4 16v petrol engine is now deleted from the range. The 1.6 litre HDi diesel is the same Euro IV diesel engine fitted to the 206 GTi HDi 110; with its particulate emission filter, it is both "green" and powerful. With a maximum torque of 180 lb ft and an official fuel consumption figure of 58.9 mpg on the combined cycle, it makes driving fun whatever the weather, and with its Quiksilver branding will be one of the hottest cars in which to be seen. The exciting new 206 range is available at Peugeot Dealers from 1 January. With free insurance* available on all 206 models registered before 31 March 2005 and £400 of free fuel** on every non-fleet diesel 206 model, ordered before 31 January 2005, the best January sales bargains are to be found at the local Peugeot Dealer. ** £400 of free fuel on any new Peugeot 206 diesel model ordered between 1-31 January 2005 and registered by 31 March 2005. A cheque for £400 will be sent to all eligible customers directly from Peugeot following the registration of the car.